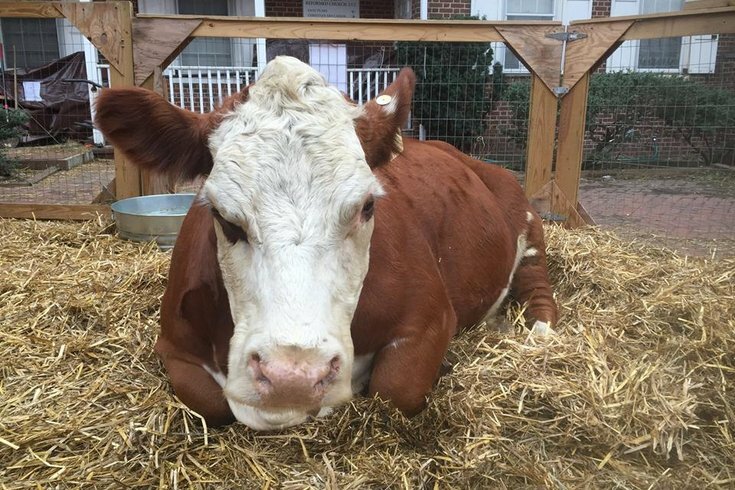 Stormy the cow, a fixture in a live nativity scene at 4th and Race streets, felt like exploring Philly. The bovine deserted the popular attraction at the Old First Reformed United Church of Christ and was found wandering the streets of Old City around 6 a.m. Thursday morning in a second attempt to escape. Stormy was first retrieved after found heading south on I-95 around 2:15 a.m., 6ABC reported. She was near Callowhill Street when police first returned her to the church. Then, ever the rebel, Stormy broke free a few hours later and began wandering around 4th Street – all the way to the upper level of a parking garage at 4th and Arch Streets. Police tweeted a warning of traffic delays in light of the hunt for Stormy. The pastor initially tried to stop the cow, 6ABC reported, but Stormy was not returned until cornered by police in the parking garage around 7 a.m. I will seriously take that cow if they need a home for it. I’m not kidding. Stormy is reportedly 1,500 pounds and from Roxborough’s Manatawna Farm. She is 7.5 years old. The church's web site says the cow is an "absolute love who does not seem to be bothered by anything going on in the neighborhood." She is one of the popular animals in the live Nativity scene, which continues at the church through Dec. 27. Here’s hoping Stormy stays safe but never loses her adventurous spirit.